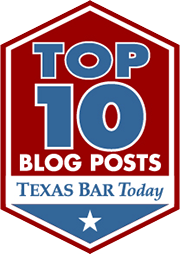 Assault – Family Violence is probably the most serious misdemeanor offense in Texas. As we discussed last time when we reviewed TPC 22.01 a normal Assault is a Class A Misdemeanor, and adding a family violence allegation doesn’t change that. Family Violence Assaults are still Class A Misdemeanor, the problem is that a plea of guilty, even without a conviction carries serious consequences beyond just being on probation (employment, immigration, child custody, inter alia). A few years ago the legislature added another enhancement to Family Violence Assault which makes the offense a 3rd degree felony (2-10 years in prison, up to $10k fine). Lawyers usually call this enhancement “choking”, but the actual language of 22.01(a)(1)(b)(2) doesn’t include the work choke anywhere. It doesn’t really require a “choke” in that your place your hands around someone’s neck and squeeze. I’ve seen choking cases filed where someone was sat on, or put in a headlock, or simply hugged really tight during an altercation. The language is really broad and allows for any conduct that puts pressure on a throat or neck to count. This enhancement is powerful leverage for a prosecutor in plea bargaining the case. Being convicted of family violence is bad enough, but the possibility of being a felon is probably worse. We see a lot of these cases where the State will offer a misdemeanor family violence probation and that can be a tough offer to turn down if you are looking at 2-10 in prison.